Recently a friend asked me why I love New York so much. At the time I couldn’t articulate a response. I’m not sure why I love New York. Maybe because here anything is possible and you can be whatever you want to be. It is a city for people with great expectations. The “I ♥ NY” logo was created in 1977 by Milton Glaser, a graphic design legend. It has become a famous icon. 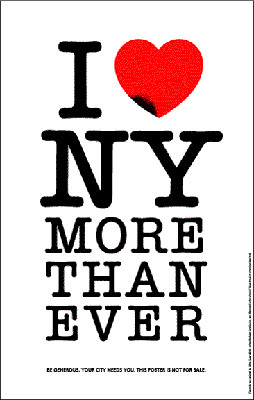 As a reaction to September 11, Glaser created the “I ♥ NY More Than Ever” poster with a little black spot on the heart symbolizing the World Trade Center. The black spot is the approximately location of the site on Manhattan.